Line of sight in GIS is a phrase used to described the unimpeded view or access from one point to another point across a terrain or surface. Visibility analysis is a spatial analysis of the portions of a line that are visible as opposed to not visible from a starting point. Line of sight is used to understand the visible and obstructed (non visible) points in terrain which contains significant changes in elevation (in the form of mountains/hills and valleys). Line of sight is an important analysis tool in many fields. For example, a developer may use line of sight to determine the best place to site a house on a hillside in order to create the best view of the ocean. The telecommunications industry uses visibility analysis to best site cell phone tower locations which need to have an unobstructed view of other cell phone towers for transmission purposes. For military purposes, line of sight is used to understand optimal positions for battle. In law enforcement, line of sight analysis can be used to canvas a crime scene to search for witnesses. 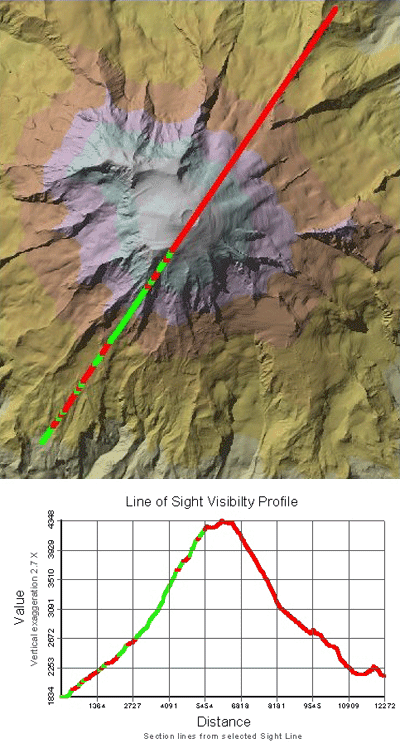 Line of sight analysis showing the obstructed (red) and visible (green) points across a terrain. Doing a line of sight analysis in ArcGIS requires the extension 3D Analyst. Esri has a help page on line of sight. 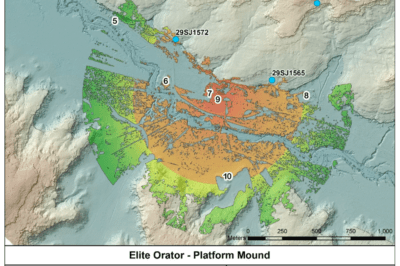 When selecting the line of sight tool using 3D analyst, the user loads in a DEM (digital elevation model) that contains the elevation information required to perform the terrain analysis. Next, the user will need to enter the offset Z values for both the observer and target locations. The offset Z values in the height measurement off the ground that the line of sight occurs at. For example, if the visibility analysis is being performed for a person, it may be set at a height for an average person. For example, if the units are in feet, then the parameter inputted would be 6. If the line of sight analysis is being done to cite a cell phone tower, then the units for the offset Z value would need to reflect the height of the intended cell phone tower. Then use the mouse to click the starting point and drag the mouse over to the ending point for the line of sight visibility. The resulting graphic shows the line of sight (see the image above) which is color coded with green for visible areas and red for non visible areas. Esri also offers a Linear Line of Sight tool as part of its Military Analyst extension which uses DTED catalogs and surface raster datasets to create a shapefile of visible and non visible points along a line. 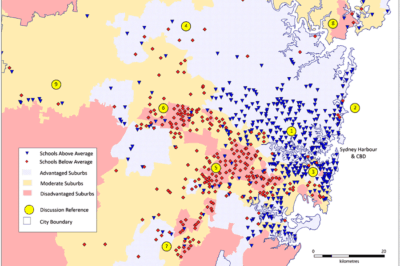 Line of sight analysis is known as visibility analysis in QGIS. There is a visibility analysis plugin developed by Cagil Seeker in the QGIS plugin repository. The plugin is not part of the official QGIS plugins but can be downloaded from pyqgis.org. 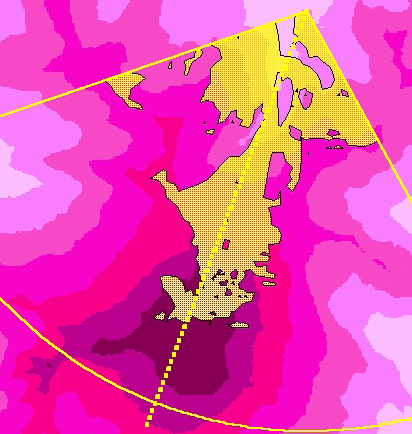 The field of view analysis in GIS is a polygon file that shows the portions of an area that are visible versus no visible across a terrain starting from a given point. 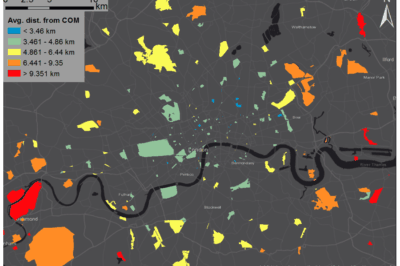 Field of view analysis in GIS. The yellow areas are visibile from the starting point at the top of the screen.